This beautiful warm home is set in the near west foothills of the Tucson Mountains on 2 serene acres, yet just 15 minutes from downtown Tucson or the Tucson Desert Museum. Two full baths plus a large powder room. The Starr Pass Golf Resort is 10 minutes away as well as the nearest supermarket-pharmacy. Come home to your private swimming pool and spa and just relax in this warm, inviting home full of natural stone and wood viga beams. Magnificent Southwestern Home in Tucson: 3,000 sq ft , 4 bed/3 bath luxury vacation home in the foothills of the Tucson Mountains. Sleeps up to 8 comfortably. Serene west side elegant Santa Fe Style home in private community with large lots, but only 12 minutes from downtown. Set on 2 acres of tall saguaro cactus, this beautiful oasis with swimming pool and outdoor hot tub surrounded by uniquely desert flora provides a great getaway headquarters for family or friends looking to enjoy Tucson’s great golf, hiking, shopping or just quiet relaxation. Enjoy great views of city lights and the Catalina Mountains from the balcony and pool patio. The home is newly decorated with 2 large HDTVs in living room and Master bedroom. The brand new heating/cooling system and ceiling fans in every room and solar pool/spa heater assure your comfort after a day enjoying all that the area has to offer. Pool can be heated for a surcharge during the colder months. Step out of the dining room onto the patio with covered dining area and inviting Pebbletech pool and spa. The generous 3 car garage with inside entrance to the house completes the experience of convenience and opulence. Large upper and lower parking areas for guest parking and easy turn around. Located a few minutes from the striking Starr Pass Golf Resort , supermarket and pharmacy and big box stores for your convenience. With more than 20 golf courses less than an hour away and the Tucson desert museum and Old Tucson movie studios just 15 minutes away, there’s plenty to do and see, Birdwatchers and animal lovers will delight in this natural unspoiled haven. Start your desert experience at the end of the 350 ft driveway and hike in the Saguaro National Park or drive to many of the Tucson area’s uniquely Southwest Colonial attractions. With gourmet kitchen, breakfast area, two story living room and 3 + bedrooms downstairs, giant master suite upstairs, most with warm natural flagstone floors and counters, this home will draw you in and make you want to come back again. I've been a Homeaway member at this house for since 2008. I'm happy to have helped families make wonderful vacation memories since then. We fell in love with the warm ambience of the house. So roomy and welcoming. Lots of privacy on 2 acres yet just 5 minutes to the majore stores and banks an 15 minutes to the vibrant downtown area with new restaurants and galleries springing up all the time. toilet, combination tub/shower, natural stone, sinks in outer part of bathroom. Luxurious Master bath with city views and all natural flagstone with jacuzzi tub, separate shower. Both downstairs baths with natural flagstone all around. Just a quick 15 minute drive to downtown, including the Convention center and the very lively Congress Street with lots of new restaurants. In the foothills of the Tucson Mountains just west of downtown. Hiking starts at end of driveway. Look across Tucson valley to the Catalina Mountains while nestled in the foothills of the nearby Tucson Mountains near Saguaro National Park West. Dove Mountain Oro Valley views. Two part wall oven and 5 burner gas stovetop. Two part with microwave included. Spacious and well appointed with large windows. Stainless appliances. 6 burner gas cooktop. double wall oven. Separate 6 seat dining area as well as breakfast nook seating 4. The chairs in the adjoing breakfast nook can be pulled up to seat more guests at dining table. sometimes there are puzzles and some board games. closest Starr Pass Resort and Silverbell public course about 10 minutes away, many more within 10 miles. Unfortunately, a few too many steps :(. The three downstairs bedrooms are accessible but there are 3 steps down to the sunken living room. The garage can be reached without going outside, though. Two large HDTVs, one in great room, one in master suite. Separate breakfast table and outdoor patio dining table. Solar heated swimming pool/spa. Pool can be heated to 82 degrees during the colder months for a surcharge. Oversize 3 car garage. House is set in Saguaro filled 2 acres. See deer, quail, javelinas hummingbirds and on a quite residential area with 2 acre minimum lots. Gorgeous setting. Very nice home, excellent layout. Made for a beautiful homebase for our family wedding weekend in Tucson. Only minor complaint had to do with burnt out lightbulbs in a number of light fixtures and lack of serving utensils in kitchen, otherwise we had an amazing stay at this gorgeous property. Hope to rent again in the future. Great property, location and house! Jeffrey was extremely responsive. We had a great time. The house was nice with plenty of room for all six of us. We hiked close by at Gate’s pass and had many breakfasts in the kitchen. The owner gave us a quick tour when we first arrived and gave us the great hiking suggestion! We would pick this house again! The house was perfect for our large group. The location made it easy to get wherever we needed to go. Jeff was easy to work with from beginning to end. We've stayed before and Jeff was able to accommodate us on short notice. The house is well cared for and we met some of the neighbors walking their dogs in the morning. The pool was great in the hot weather. 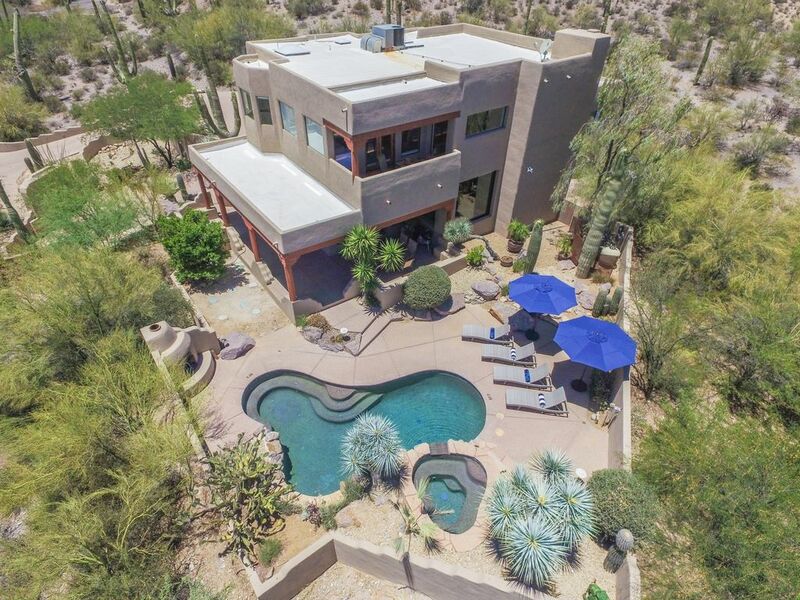 This home is set in the private and serene foothills of the Tucson Mountains, a short walk from fascinating desert life of the Saguaro National Park (West) and just 15 minutes to downtown. The are new dedicated cycling trails. Tucson is becoming a bike friendly city. 10 minutes to supermarket/pharmacy and 'Big Box' stores as well as Highway I-10. Nearest golf are Silverbell public Golf Course Starr Pass Resort just 10 minutes away, with over 20 golf courses less than 60 minutes away. Take in the magnificent view at Gates Pass on your way to Old Tucson Studios and the Tucson Desert Museum, also 15 minutes away. Chiracahua Mtns, Tombstone, historic Bisbee, and the wineries of Elgin are less tha 1.5 hours away. Or take a day trip to Rocky point Mexico, 3.5 hours away - Arizona's beach. Pool heat at 82 degrees is available for about $250, depending on the time of year with a $100 minimum. $2000 to $3500 per week, $4800 to $13000 per month. The state/county taxo f 12.05% is not applicable for stays of more than 30 days. Pool heat is available as needed in season at the rate of $250 per week. It is generally not needed from late spring to late fall. There is solar pool heat which increases the temperature a few degrees year round. Rates also dependent on length of stay. State hotel tax applies to stays of less than 30 days. Weekend surcharge in high season for stays less than 7 days. Pool heat is $250 per week prorated. Over 4 to 8 guests may incur a surcharge, depending on the seasonal rates. Weekly only during gem show. More flexibility and multiweek discounts other times of year. Great monthly rates in summer. Pool heat $250 per week. 10 % of rental fee is nonrefundable rebooking fee. All rental amounts paid will be nonrefunable unless we can rebook those dates.